I competed this past weekend in Pittsburgh. The past week was an emotional roller coaster, with lots of tears, thoughts and reservations about going to Pittsburgh. It's been a very rough couple of weeks for me, I've had to come to terms with the fact I need to make dramatic lifestyle changes due to my health. I haven't been feeling well...for quite awhile now. After eliminating other ailments from the table, It seems I'm left with Chronic Fatique Syndrome. I felt sorry for myself for a few days, this meant no more crazy workouts, and possibly feeling yuk a lot of the time, then I smartened up and took time to reflect. Why was I even working out so hard to begin with? I don't even enjoy lifting weights lol I was trying to gain approval from others by doing what I was told I'd be good at. Truth is, I love to dance in the living room, walk peacefully along the tides of the ocean, rollerblade, yoga, I want to exercise with grace because I enjoy it and the healing nature around me. Everyone always says "Moderation", but I certainly wasn't doing that with my training, or my desire to be the best. I was living in ego consciousness. That's not where I want to be or where my true path is, its in the mystical/spiritual consciousness. Last week, as I was practicing posing for the Pittsburgh show, I just collapsed in a state of mental and moral confusion. I had spent all this time prepping for the show, but it’s not on my heart. I feel run down. I’m tired all the time. My hip is injured. Morally, I can’t see spending hours in the gym so my abs look good a benefit to society. Especially when I live in an area where homeless people are on every street corner and sleep right outside my complex. At first, I wanted to compete just to say I did. Then there was the draw of the stage. And, while I’m in school for acupuncture, I don’t know how quickly my practice will pick up, so having a back-up plan (personal training) is beneficial. And being a NPC bikini competitor, especially one that places, can help me in marketing myself to clients. But the clients I want to help are everyday people, with jobs, kids and crazy lives, needing a push to make healthy lifestyle choices, not aspiring to spend three hours in the gym. Between school (a must) and competition prep, I have no time for things I value as more important, such as my marriage. It would be nice to have enough energy to doing something with Hubs other than just watching TV. So, in going to Pittsburgh I brought my worst attitude possible. I didn't feel like I should be there, I was dreading every moment, and complained to my family in every conversation throughout the weekend. But Hubs told me that if this was going to be one of the last shows I compete in, I should at least just have fun. I prayed the whole weekend. And rather than looking at Pittsburgh as a waste of time and money, I decided to take it as a learning process and an experience. 1. I got to meet some of the fitness world’s most famous. 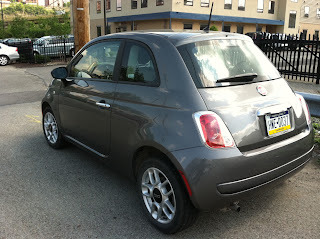 I got to drive a Fiat 500 ... which I will never drive again. 2. I was surrounded by other teammates. 3. I was able to meet with my coaches and get some feedback. I also realized that I am not mentally or physically ready for a national level competition, which I had planned on doing one in August. Not to shabby, but not good enough ... I placed 12th of 25. Outside of Pittsburgh, I realized I do want to compete, but I have decided to change direction of my training. I will still be with Bombshell, but I am not going to do a show until the fall. I also want to incorporate a healthy lifestyle: see a doctor about my exhaustion, and not feel terrible if I miss a workout to spend time with Hubs or beat myself up if I have a frozen yogurt mid-week. Hopefully this will leave time to post a bit more as well!